Welcome to our series of free UCAT lessons! It’s great to have you here, and we look forward to working towards UCAT success together with you. Follow along with Ashton, our Head of Learning, as he breaks down questions from each section of the UCAT and teaches the step-by-step techniques for solving them. Aptitude tests like the UCAT assess your skills and abilities. To master any skill, you need to become familiar with the process it involves, and then practice that skill so you can perform it efficiently and effectively. Therefore, these videos provide a detailed explanation of the techniques that are currently being used by students on our course, and they will help you to develop the skills you need to answer any UCAT question. **Disclaimer: we don’t expect you to spend this long on each question! It takes time to teach and learn concepts, especially new or complex concepts. These videos are for teaching purposes, so we take extra time to go through the techniques in detail. Once you’ve learned the techniques, you definitely won’t need to spend more than a few minutes on each question. Practice makes perfect - but you first need to know what you’re practicing, which is why we provide clear and extensive videos to explain the technique for each question type. New tutorials will be added every few weeks, so stay posted! 1. How many hours of UCAT preparation should I do per week? The first thing to remember is that the number of hours you put in does not directly correlate to success. What is more important is how you use that time – whether you’re using it to apply the techniques, overcome your weaknesses, and improve your accuracy and speed. These are the things that will help you to succeed. However, this being said, there is still a threshold for the minimum amount of time you would need to be adequately prepared. We would recommend that you spend at least one 3-4-hour slot per week (e.g. one afternoon on the weekend) on UCAT study. 2. How important are UCAT practice exams? In terms of the actual amount of benefit they provide, practice exams are somewhat overrated. For example, if your maths teacher gives you a calculus exam before you’ve even learned calculus, the exam would not be very useful – it would only drain your stamina and decrease your motivation (which is not a very effective way of learning!). Similarly, UCAT practice exams are only useful once you’ve mastered the steps required to solve every question type. Put another way, practice exams should be used at the last step of your preparation, not the first. Save yourself some time and learn the techniques for solving questions first! 3. Is UCAT the same as UKCAT? Yes. According to the official UCAT website, “although new to Australia and New Zealand for 2019, the UCAT has been used for over 12 years in the UK under the test name UKCAT”. 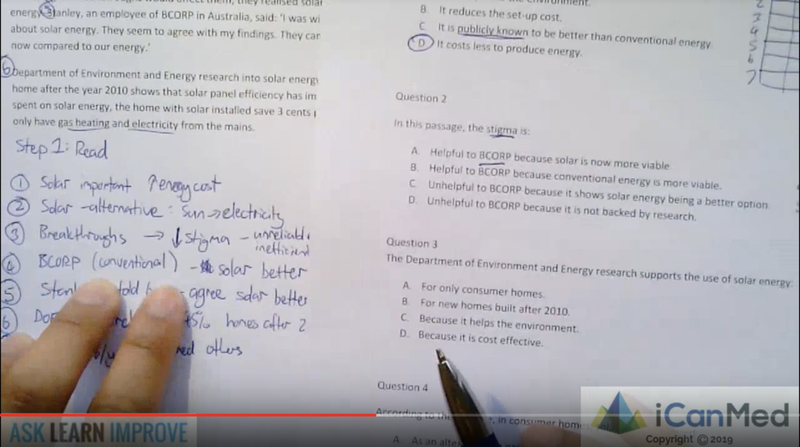 The contents of the UKCAT “represent the exact content of the UCAT ANZ test” (https://www.ucat.edu.au/ucat-anz/practice-tests/). 4. For students who usually qualify for additional reading time, etc. (e.g. those who have reading disabilities), how does the UCAT accommodate for them (if it does)? Candidates can apply for extra time by submitting an application for Access Arrangements when registrations open. For more information, refer to https://www.ucat.edu.au/ucat-anz/registration-booking/access-arrangements/. 5. Can Australian candidates use the UCAT to apply to medical schools in the UK that use UKCAT as part of the selection criteria? Candidates can sit UCAT (ANZ) and apply to UK universities (that accept UCAT UK) with the results. However, candidates cannot sit UCAT (UK) and apply to UCAT (ANZ) universities. 6. There is speculation that the UKCAT is now called UCAT globally (i.e. from this year onwards the name UKCAT does not exist anymore but has been replaced by the name UCAT). Is this true? UKCAT has been relaunched as UCAT. There is a UCAT (ANZ) test for Australian and New Zealand universities and UCAT (UK) for UK universities. 7. Is there any difference at all between the UCAT (UK) and UCAT (ANZ)? For example, in terms of medical ethics used to solve Section 5 questions, will the UCAT (UK) be based on the UK medical system and the UCAT (ANZ) be based on the Australian system? The UCAT (UK) and UCAT (ANZ) test contain the same subtests and will not have a specific UK or Australian / New Zealand context; it will be universal. 8. The scaled marks that a student receives is a result of comparing the raw marks of all candidates with each other. In the case of Australian candidates, will they be compared to other Australian and NZ candidates only or pooled with the rest of the world? The results for UCAT (ANZ) are based on the Australian and New Zealand cohort only. 9. When should I register for the UCAT exam? We have been informed by the UCAT organisers that as soon as a venue is full, it will not accept any more students. In other words: there is limited seating for the UCAT exam. Therefore, our advice is that you register for the UCAT as soon as possible! 10. When do registrations for the UCAT exam close? Registrations close on May 17th, 2019. The registration period is relatively short, so avoid leaving it to the last minute. 11. Which UCAT exam date should I register for? You definitely shouldn’t register for an exam date that is before or during your break, as you would miss out on crucial preparation time. Ideally, you should sit the UCAT as late as possible; in previous years, the UMAT has always been held in the last week of July, so it would be best to select a similar date for the UCAT. However, you should also ask your school about assessment dates to make sure that you won’t have any assignments or tests around the UCAT exam date you’d like to register for. 12. How much does the UCAT exam cost? It costs AU$298 to sit the UCAT in Australia or New Zealand, and AU$373 to sit the UCAT in other countries. However, candidates sitting the test in Australia may be eligible to apply for the concession rate, which is AU$198. 13. Can I apply for concession? You are eligible for concession if you hold or are listed as a dependant on a current Health Care Card (HCC) or Pensioner Concession Card (PCC) issued by Centrelink. To apply for concession, you need to submit an online application form before registering for the UCAT exam. The online application form is available here: https://www.ucat.edu.au/ucat-anz/concession-scheme/. Applications for concession close on May 10th, 2019. 14. Can I cancel my UCAT exam? If you cancel your UCAT exam by May 17th, 2019, you will receive a refund. However, if you cancel your UCAT exam after this date, it will be considered a ‘no-show’ and your payment will not be refunded. 15. Can I reschedule my UCAT exam? If you reschedule your UCAT exam by May 17th, 2019, you can do so via the online registration system. However, if you would like to reschedule your UCAT exam after this date, you will need to reschedule via phone call. Rescheduling is accepted until 24 hours before your test time (but note that rescheduling will become increasingly difficult as the test date approaches since many venues are likely to be full). 16. What is the minimum mark I need to get into medicine/dentistry? Since the UCAT is being run for the first time in 2019, thresholds from previous years no longer apply. As such, there is no official ‘minimum mark’ that provides guaranteed entry into a medicine or dentistry course. Furthermore, since medicine and dentistry are highly competitive, instead of trying to achieve a ‘minimum mark’ you should focus on scoring as highly as possible in order to outperform any competition. Thresholds set by universities are generally proportional (e.g. the top 10% of students are accepted), meaning that the 'minimum mark' you need to achieve depends entirely on how the rest of your cohort performs. 17. When is the latest I should start UCAT preparation? You should start preparing now. The April holidays are a valuable opportunity to spend time on UCAT preparation, allowing you to learn the content without rushing and identify all of the issues you encounter for each question type. By starting on UCAT preparation now, you are setting yourself up to make the most of the next few months and will be able to finalise your UCAT preparation during the July holidays (right before the test). 18. How important is the UCAT compared to my academic results? For most universities, the UCAT is a major criterion in selecting candidates. In some cases, the UCAT is weighted equal to (or weighted more than) your academic scores, meaning that the two-hour test is just as important for determining medical school entry as your academic results from the entire year! Because of this, it’s important to dedicate time and effort to preparing for the UCAT, as this will maximise your chances of getting into your desired course. When trying to juggle UCAT preparation and schoolwork, many students end up sacrificing one or the other due to poor time management. However, your UCAT and ATAR results are equally important for getting into medical school. What people often don’t realise is that many universities (e.g. UNSW, Monash University) weight the UCAT at 33% of your final ranking, meaning that it is just as important as your ATAR results. So how are you supposed to manage both? First, you need to understand what the UCAT is. The UCAT is an aptitude test that assesses candidates’ ability to make evidence-based decisions and apply medical ethics in professional scenarios. Therefore, in order to score well on the UCAT, you need to develop these particular skills (and the steps that comprise these skills) in order to solve questions CORRECTLY and EFFICIENTLY every time. While the UMAT had three sections, contained 134 questions, and spanned 3 hours, the UCAT has five sections, contains 233 questions, and spans only 2 hours – meaning that speed and accuracy are crucial. Therefore, all of your UCAT study should focus on becoming very familiar with the steps for solving questions so that you can improve your accuracy and speed. Second, you need to recognise what makes the ATAR difficult. No matter what Year 12 system you are following (e.g. VCE, HSC, IB), the main difficulty with ATAR study is always the overwhelming amount of content that Year 12 subjects require students to learn compared to Year 11. This, combined with the advanced nature of exam questions, makes it difficult for students to do well in Year 12 using the study techniques and habits they applied in previous years. So not only do students need to work hard, they also need to constantly improve themselves and their study techniques. From our experience helping thousands of students over the last 10 years, we have recognised that the main reason why students struggle to balance the UCAT and ATAR is because they lack awareness about the challenges involved in each test. Put simply, students become so overwhelmed when trying to manage one that they neglect or forget about the other. In order to balance the UCAT and ATAR, students must understand the challenges that each of these tests presents, and then work on preparing themselves for these challenges throughout the following months. The best way to do this is to literally LIST OUT the challenges involved in each test (or each Year 12 subject) – this puts you in a position where you know what to pursue and how much time to allocate for both UCAT and ATAR preparation. It’s also important to be conscious of the test date for UCAT. Unfortunately, many students become complacent and decide to just cram UCAT preparation before the test date, not realising that the UCAT is not crammable. Doing well on the UCAT requires a change in your thinking process and the development of specific skills (including verbal reasoning, decision making, quantitative reasoning, abstract reasoning and situational judgment). These are not things that you can cram – they can only be achieved by regular UCAT preparation throughout the year. So if you know that medicine/dentistry is what you want to do, and you find yourself with some free time, make this into ‘UCAT time’. Balance is a result of control, which is a result of awareness. This means that you need to take charge of your own learning and ask yourself some honest questions about what you want to achieve. For the ATAR, ask your teachers for sample tests and exams so that you can begin to understand what the questions are like. For the UCAT, reach out to us and check out our Library for more resources. As a professional educator, I've spent the last ten years helping over 600 students gain entrance into medical schools across Australasia. Our strategies for UCAT preparation aim to help students learn the exact skills and knowledge they need to answer any aptitude test question (e.g. UCAT and UMAT) question accurately, systematically and quickly. We had students last year who spent just one week (the week before the UMAT) preparing using our strategies and ended up with the mid-90s (don't recommend you to start that close to the test though!). Although, UCAT is a new for Australia and New Zealand students, it is not a brand new test. We’ve already anticipated the changes and have dissected the UKCAT, the test UCAT is based on. Here are a few points you need to take into account, to sum up how to conduct effective UCAT prep. ‍UCAT assesses the logical reasoning capabilities (and certain attitudes pertaining to ethics and professional behaviours) of the candidate. Logical reasoning is the ability of a person to make decisions based on interpreting observable evidence and not by assumptions. How UCAT assesses this skill is by constructing questions that require the students to logically reason in five primary mannerisms, i.e., verbal reasoning (section 1), decision making (section 2), quantitative reasoning (section 3), abstract reasoning (section 4) and situational judgement (section 5). UCAT wants to see whether you are good at using evidence to make decisions in many different situations for many different purposes. In summary, UCAT assesses the candidate’s ability to apply a series of process (i.e. skills) to solve a question, much like mathematics. Therefore, the first natural step to drastically improving your chances of answering a UCAT question correctly is by first learning what the skills (i.e. working) looks like and why the skills works the way it does (i.e. rationale). Instead, the majority of students dive straight into doing a lot of questions before learning the techniques thoroughly. The common belief in the student community is that the more questions attempted during practice, the quicker they will master the questions. However, it is obvious that this method of preparation is in fact flawed as the primary purpose of practice is to apply a learned process in the hopes of identifying weaknesses and fixing them up. In short, there is no chance a student is able to apply skills to solve the question and learn from it when they don’t even know what that skill is. This method of preparation is a contrast to mindful practice and will only waste time, create further confusion and generate self-doubt. By learning techniques foremost, will take away all these issues and achieve an overall smooth learning experience. 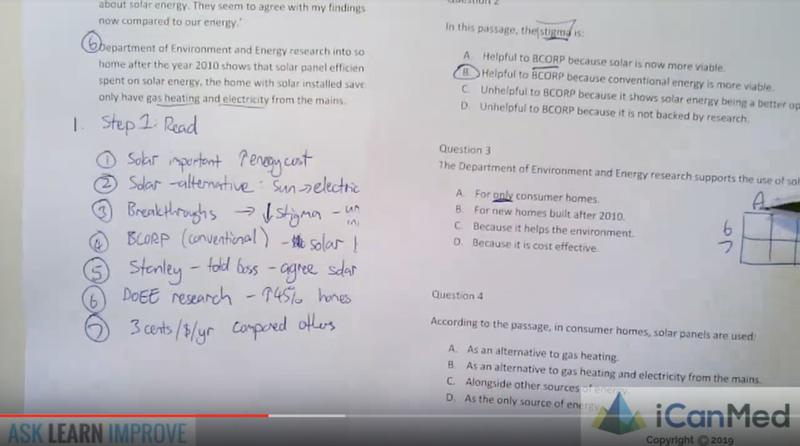 Here are a few video examples of how section 1 UCAT questions are be solved. Click on the image to watch the video! If you were to take a look at the questions belonging to same of the major types of questions, you would notice there are still subtle differences in how each question is written or formatted. Despite the fact that the questions may look slightly different, as long as you recognise they belong to the same type, the same technique can still be used to solve them. Therefore, it is crucial for you to apply the newly learned technique to a variety of question under the same question type to gain experience. A simple example is learning algebra for the first time - the question used to teach you in class will most likely be different to the first one you practice with at home but can be solved with the same technique. So find some questions that are variations of the question you’ve learnt the skills to solve and attempt to apply the same skills to an aesthetically different, but fundamentally identical question. After giving a few questions a good crack, you will realise and identify what your weak points are much easier. Examples of weaknesses may include forgetting the correct technique to use when answering the question or could also be that you weren't so good at executing one of the steps in the technique (e.g. interpreting the stimulus). Whatever it may be, step 3 allows you to isolate these issues that influence you the most. It allows you to be in control of your preparation by staying focused on things that are holding you back from achieving top marks. This step allows your preparation to fix the urgent matters identified in step 3. A part of the fixing process may require you to return to step 1 to re-learn the techniques or ask questions (feel free to leave questions in the comments below) to find solutions to your problems. After fixing is complete (when you are 100% confident about solving questions belonging to the particular question type), you should move on and do a high-volume of questions of the same type. Only commence high-volume question practice when you have gained and mastered the skills you need to solve a particular question type. When doing high-volume of questions, you can focus on gaining experience by attempting a wider range of questions, rather than worrying about how to even a question correctly. Many students who jump into high-volume question practice, such as doing practice exams, end up limiting their growth very quickly. Gaining experience by solving a variety of similar questions with the same basic technique is very helpful to gain speed, accuracy and consistency. Also if a similar question pops up in the real UCAT, you will know exactly how to tackle it. If you want to know more about how iCanMed helps with UCAT preparation, click the button below! UCAT stands for University Clinical Aptitude Test and is the exam that has replaced UMAT (Undergraduate Medicine and Health Sciences Admissions Test). The UCAT is a required assessment in order to be eligible to enter medicine and dentistry in Universities around Australia and New Zealand. The UCAT is logical reasoning test based off the UKCAT, which is used in the United Kingdom to test their medicine candidates. It is unlike any other exam a Year 12 students would have experienced before as it is vastly different from knowledge-based assessments like Biology or Chemistry. There are more similarities with other logical reasoning exams like the UMAT and MCAT so some skills are transferable but it is essential to learn exactly how UCAT will test their candidates and identify the exact skills required to do well in the UCAT. What is the test format for UCAT? The UCAT is a two-hour computer based multiple-choice test. It consists of five separately timed subtests. Once the test has started, time will not pause until either every subtest is finished or the allotted time runs out. Each subtest represents the five different sections and have different amount of questions and time allocated for each section. Students must complete one section first before going onto the next section and the order for the sections remains the same for every student. The order of sections is the same as listed below. There is a one minute “break” before the start of each section which will display instructions. 25% Extra time may be given for candidates with special education needs, disabilities or temporary injuries and must lodge forms to UCAT to be approved before the exam. An onscreen calculator is provided on the same screen as the test. For scrap paper, a booklet and pen is provided. How does scoring work for UCAT? Presently there is no information on the scoring of the UCAT however the content is equivalent to the UKCAT. For the UKCAT, the first four sections are scaled and scored evenly. Each section has its raw marks converted to scaled scores that share a common range from 300 to 900. The total score is the addition of the individual scores for the first 4 sections - Verbal Reasoning, Decision Making, Quantitative Reasoning and Abstract Reasoning. This gives a total scale score that can range from 1200 to 3600. The UCAT is a multiple choice exam, with different sections and question types having different number of answer options. There is no negative marking for incorrect answers and performance on one questions does not influence which other questions are presented. Verbal Reasoning – Each question is worth 1 mark each. Decision Making – Question with one correct statements are worth 1 mark. Questions with multiple statements are worth 2 marks, 1 mark is awarded for partially correct responses. Quantitative Reasoning – Each question is worth 1 mark each. Abstract Reasoning - Each question is worth 1 mark each. Each section may have different number of marks but are scaled evenly to give a score between 300 to 900. The total score will range between 1200 to 3600. Section 5 – Situational Judgement is a bit different because it’s not deemed as a “cognitive” test but a test to measure “non-cognitive attributes”. Scoring for this section is taken from your raw score and directly placed into one of four bands with band 1 being the highest and band 4 being the lowest. What score do I need for UCAT? Medicine will remain as competitive entry so UCAT results will be very similar to the percentile rankings in UMAT. To have a competitive UCAT score, you should rank 90th to 100th Percentile (the top tenth of all candidates sitting the exam). Previously the UMAT required a 90th percentile to be competitive and it is a good benchmark to aim for the UCAT. This means you need a score of 2860 (roughly 69% raw) and reach Band 1. Currently, universities have not released their requirements for 2020 intake so there is no information on what exactly is needed for UCAT 2019. We will update the information as soon as it is released. What is involved in each section of UCAT? Section 1 to 4: Cognitive abilities testing. This involves logical reasoning and critical thinking. Section 5: Non-cognitive abilities. This is mainly about ethics, morals and interpersonal-skills. Verbal Reasoning assesses the ability to read and think carefully about information presented in passages and to determine whether specific conclusions can be drawn from information presented. No prior knowledge is required to answer the questions. 21 minutes is given to answer 44 questions. There are 11 passage with 4 questions each. The passage will read like a newspaper or research article. There will be a statement and you have to choose whether the statement is TRUE, FALSE or CAN’T TELL based on the information from the passage. Decision Making assesses the ability to apply logic to reach a decision or conclusion, evaluate arguments and analyse statistical information. No prior knowledge is required except basic arithmetic (addition, subtraction, multiplication and division of small numbers). An onscreen calculator is provided and may be used. 31 minutes is given to answer 29 questions. All questions are standalone and do not relate to one another. Each question has an individual premise which may be a set of rules, venn diagram or something visual which you need to interpret. This is liken to learning a set of rules to a “game” and being able to answer a question based on the given rules. Questions will have 4 answer options with only one correct answer and are worth 1 mark each. There are 5 statements and you have to place YES or NO beside each statement and are worth 2 marks for fully correct responses and 1 mark for partially correct responses. Quantitative reasoning assesses the ability to use numerical skills to solve worded problems. The mathematics required is at the “A” level in Year 9 in Australian schools, particularly in the topics of rates and ratios. 24 minutes is given to answer 36 questions. A set of rules for a situation or a visual graph may be used to represent the information. Students need to read the graph and all relevant information correctly and calculate using basic arithmetic (addition, subtraction, multiplication, division) the desired solution. An onscreen calculator is provided. Most questions will have four questions connected to the same data. Some questions will be standalone and only have one question. There will be 5 answer options for each questions and you are required to select the best option. Abstract reasoning assesses your ability to identity patterns amongst abstract shapes where irrelevant and distracting information may lead to incorrect conclusions. You must test, critically evaluate and adapt your process as you are finding the pattern. 13 minutes is given to answer 55 questions. There are 4 different question types in this section. Type 1 will present you with two sets of shapes labelled “Set A” and “Set B”. There are 6 shapes in each set. You will be given a test shape and asked to decide which set the test shape belongs to. You will usually be given 5 test shapes for every given sets so 5 questions will use the same data. Type 2 will present you with a series of shapes and you will be asked to select the next shape in the series. Type 3 will present 3 images. It will compare the first two images then it will ask you to compare the 3rd image with the answer options in the same way it compared the first two images. Type 4 is similar to type 1 except you will be given 4 answer options and must select the answer option that belong to a certain set. Situation Judgement assesses the capacity to understand real world situations and identify critical factors and appropriate behaviours in dealing with them. This is a non-cognitive assessment and deals more with interpersonal skills. No prior medical or procedural knowledge in hospitals is required however since it assesses interpersonal skills, it is required to understand what is appropriate under general settings. 26 minutes is given to answer 69 questions. A scenario will be given and there will be between 2 to 5 questions associated with that scenario. Questions will ask you to rate the importance or appropriateness of possible actions. Questions will require you to rate each of the 4 answer options. Questions will ask you to select the most/least appropriate from 3 answer options. What should I do to start preparing for UCAT? It is important to Understand what UCAT truly assesses. An understanding of the five sections is required BEFORE you do any substantial amount of practice. This is like learning concepts in mathematics first instead of just diving and doing endless amounts of final year exams. Your school teach school subjects that way and neither should you learn UCAT that way too. iCanMed has already dissected the components of UCAT, what it’s assessing, how it’s assessing students and how students should tackle questions and prepare from now until July 2019. Come for a FREE SEMINAR! We have already held free UCAT seminars in Sydney and Brisbane. We will travel around the NEXT FEW WEEKS to all the major cities to hold free face-to-face workshops in Sydney, Melbourne, Brisbane, Perth, Adelaide, Auckland and Otago. Follow us on facebook. We’ll update you with the latest news about the UCAT and the best ways to prepare for it filled with top professional advice. You can also ask us anything. Take a look at the UCAT website but do take note that registrations are not open yet. Don’t worry, we’ve got you covered. Right now your focus should be on exams in university or high school. As long as you’ve followed us on Facebook, come to our free workshops or register for our course, you will have everything you need to succeed in UCAT and get into medicine. Our course will be available starting in October! “As long as it works, it’s fine”. An aptitude test like UCAT has a logical process to solve every question. If you are not sure why something is correct, you may have gotten the answer wrong. Even you select the correct answer (since it’s multiple choice), you may have the wrong reasoning , which will lead you to select wrong answers in the future. You must learn the correct processes and strategies. Trusting the wrong preparation. Already there is a lot of incorrect information out there given by preparation companies. We have seen students been led in the wrong direction, which actually has an effect of lowering their score. Do not trust other places so easily. Look at our content, it should make perfect step-by-step sense and allow you to see real progress. That’s how UCAT preparation should be. 1 March 2019 – Test booking system opens (fees TBA however there are concession rates). You can access your UCAT score immediately after your test. I’ve started preparing for UMAT, did I waste my time? Even though UCAT is a different exam, there are similar aspects to both the exams since they are both aptitude tests. UMAT Section 1 is still very relevant in the UCAT. You may still use some preparation material from Section 1 as long as it is actually educationally sound. UMAT Section 2 is not relevant at all and should be discarded from your preparation. UMAT Section 3 is somewhat relevant but has undergone massive changes. You shouldn’t use UMAT preparation from this section. The UCAT is new to next year. To keep up to date and have the insight on how to get the best marks in UCAT, make sure you follow or see us. 2018 is the last year the UMAT will be held. From 2019 onwards, medicine and dentistry will require the University Clinical Aptitude Test (UCAT). The UCAT is the new admission test used by all the universities in Australia and New Zealand for their medical, dental and clinical science degree programs. This means that medicine and dentistry applicants for the 2020 intake must be advised that they will no longer be required to sit the UMAT but rather the new UCAT. If you have sat the UMAT this year in July 2018, your score will be valid for applications this year. This was the last UMAT to be held and there will no longer be any more UMAT in the future. For those applying in 2019 for the 2020 intake, you must register for the UCAT. Registration begins 1 March 2019. Testing takes place throughout July 2019. The UCAT is still going to be an aptitude test except now it is over TWO hours with FIVE sections. It is a computer-based test that cannot be paused for a break once started. The five sections to the test are done consecutively and you’re unable to jump between sections but have to complete them one at a time. There is a time limit for each section. There are some similarities to UMAT with the styles of questions given, however there are also some drastic differences. For more information on how to begin preparation, check out our Beginner’s Guide to UCAT, which will be posted up shortly. Why was UMAT replaced with UCAT? A consortium of Australian and New Zealand universities have been discussing on a way to improve the old UMAT exam. They have recently decided to change it to the UCAT because they have deemed it more reliable in assessing the skills required for medical and dentistry students. 1. Watch out for incorrect information - There is already a lot of misinformation out there about the UCAT from a lot of private preparation providers. 3. Keep up to date with the most accurate information – Our website will always display the latest information.